What a disappointment Martin Scorsese's biopic of George Harrison is. Yes, there is much evocative and painstakingly restored archive footage in Living in the Material World. But the last twenty minutes has a power dressed Olivia Harrison filmed in what looks like a Hilton Hotel restaurant delivering the authorised version of George's last years aided and abetted by that noted authority on contemporary culture Jackie Stewart. That closing sequence looks suspiciously like Scorsese's quid pro quo for the Harrison estate's release of archive material. Olivia Harrison is credited as co-producer on the film and Living in the Material World raises important questions as to whether the control of archives by the estates of deceased celebrities will prevent future impartial reassesments of their lives and work. 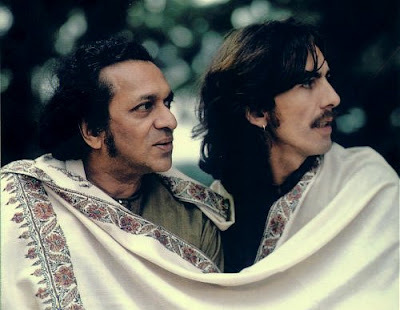 The header image also appears in my earlier post on George Harrison's collaborations with Ravi Shankar. I’m still looking forward to seeing it, even with the shortcomings you describe. But “that noted authority on contemporary culture Jackie Stewart” raised a smile here; as much as I love Jackie Stewart (and I really do, honestly), he’s not at his best when straying away from the smell of petrol and burnt tires. Brings to mind his fairly disastrous attempt at political commentary, justifying Formula 1’s return to Bahrain over the summer to Radio 4’s Eddie Mair when it looked, briefly, like the aborted GP would be on again. Should stick to recounting his near fatal crash at Spa in ’66. Which he does. Frequently. Andrew, I am with you completely. I was lucky enough to see Jackie Stewart race in Formula 1 and other categories (those were the days) in the 1960s and 70s. He was a maestro at the wheel, but makes a disastrous talking head when filmed by Martin Scorsese in what appears to be his home gymn. Your comment does lead me to Asif Kapadia's Senna. That was one of my truly great experiences in the cinema, which I am afraid Living in the Material World was not. But then I was there at Monaco when Senna almost won in a Toleman and at Estoril when he took his first grand prix win. That was in a Lotus, and as I write I can hear the distant scream of a car on the Lotus Hethel test track, which is close to our house. Someday I may be tempted to write about that distant path of Formula 1. I have some interesting unpublished photos from those days. How wonderful to discover Pliable is also a motor racing connoisseur! Senna was a wonderful thing, and achieved so rare a feat by broadly appealing to people with no interest in sport or motor racing. Even my wife enjoyed it, and she absolutely refuses to join me on the sofa for the fortnightly parade of whining noises that is F1. I was 10 when Senna died; it remains one of my most vivid childhood memories. I for one would love a path leading to your Grand Prix pics.